Frank Lowy is upbeat as he guides The AFR Magazine around New York’s newest retail precinct. Almost 15 years have passed since the devastation of the 9/11 terrorist attacks and finally here he is, preparing for the official August 16 opening of Westfield’s part of the rebuilt World Trade Centre. We are in the Oculus, a luminous, cathedral-like structure designed by Spanish architect Santiago Calatrava that is the centrepiece of the Westfield World Trade Centre. Lowy looks up and marvels at the renaissance. The site is alive again, and for him and his family, this time around it has special meaning. As the chairman of Westfield Corporation begins to express his pride and satisfaction at America’s comeback, someone in our small group points across the way and mentions that a delegation from Israel’s transport ministry is touring the centre too. Within a nanosecond Lowy strides over and makes himself known. It quickly becomes evident that he doesn’t need to do that because they already know him. As they laugh and chat in Hebrew, Lowy’s distinctive white hair can be seen in the middle of them. This kind of confident reaching out, making connections and building relationships is why an Australian shopping centre company came to have its name on the retail component of what is effectively a sacred site in the United States. That it is in the heart of the revitalisation of Manhattan’s downtown, the world’s most closely watched urban renewal project, says much of Lowy’s vision, determination and pragmatism. It comprises five new office towers, a transportation hub, a performing arts centre and the National September 11 Memorial & Museum. And how the Westfield shopping complex actually works, with its emphasis on public transport and urban infill – and with a once unimaginable amount of its income to be derived from events, branding and digital – speaks volumes about the future of the Westfield business. As for the Lowys and their executive team, it’s been quite the journey. Westfield first won the lease for the World Trade Centre retail precinct in 2001, a mere six weeks before terrorists chose that exact spot to change the world forever. 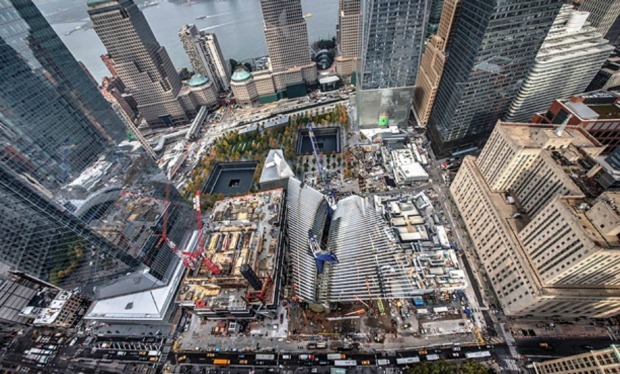 A 2014 aeriel view of construction of the Oculus at the World Trade Centre site in New York. When Westfield began its relationship with the World Trade Centre, it already had 39 malls in the US, although none in New York City. The Westfield group was one of the top three listed owners and managers of shopping malls in the US. It had been operating in the US for some 25 years and in a novel move, had branded all its malls. Although the US was home to the best known brands on the globe, no one had ever thought to brand shopping centres before. The move into New York City had its roots in a 1986 Caribbean cruise. In a typical example of Frank Lowy networking, he took a seat at a blackjack table and struck up a conversation with an American sitting next to him. Soon he was visiting the American in New York and meeting his friends. One of them was Larry Silverstein, president of Silverstein Properties. A few years later Silverstein was on the board of a Westfield company. In 1998, the Port Authority of New York & New Jersey decided to privatise the World Trade Centre to add to the city’s tax base and provide funds for other Port Authority projects. Silverstein was putting together a bid for the 99-year lease and discussed it with Frank, who joined as a minor partner. Frank was almost 70, he’d wiped the word retirement from his vocabulary and was privately intent on seeing the Westfield name in two truly global cities – London and New York. An artist’s render of how the Oculus retailing space will look. While Frank led the campaign to establish Westfield’s presence in New York, much of the detailed negotiations fell to his son Peter, who has been based in Los Angeles since the early 1990s. Peter, now co-chief executive of Westfield Corporation with his brother Steven, describes Westfield’s move into Manhattan as opportunistic. It was also a classic leap of faith. The numbers might not have stacked up, but Frank could see the opportunity for global branding and would not be deterred. For a man highly focused on numbers, he paradoxically believes they are not everything. Vision is crucial and with decades of experience behind him he backs what he can imagine – sometimes against the best advice money can buy – and then takes others with him. Silverstein Properties’ tilt for the World Trade Centre fell short of US real estate giant Vornado Realty Trust’s winning bid of $US3.25 billion. The partners upped their bid, but Vornado got the nod in February 2001. Then Vornado wanted to change the deal, and Silverstein’s bid was accepted. It was described as one of the richest transactions in the history of New York and there was much celebration. Westfield had paid $US420 million for the 99-year lease on 40,000 square metres of retail space occupying two levels of the World Trade Centre above ground and two levels below. Lowy planned to turn it into a Westfield showcase. But six weeks later the aeroplanes hit, the worst terrorist attack in US history. On that day back in Sydney, Lowy was woken by a phone call; someone was telling him to turn on the television. “Horror, horror, horror – is what I saw,” he says. “We’d been operating in the US for a long time and were so involved with the country that we felt it was an attack on us all.” The loss was also personal; a Westfield executive died in the attack. After the collapse of the twin towers, the nation convulsed with grief. No one was quite certain what to do next. Then rebuilding and creating a memorial became a national crusade. And like so many crusades, the politics between the crusaders – the Port Authority, Silverstein Properties, the insurers, the designers, the city, the state and the nation – became all consuming. Frank and Peter Lowy took a pragmatic view. The opinion of an Australian shopping centre owner, even one with a lease over the ground level of the site, was unlikely to be heard. “We did not want to be obstructionist or in the middle,” says Frank. In 2011, the way was clear to buy back into the project and Westfield bought half the mall space. In 2013 it bought the remaining share for a total cost of $US1.425 billion. This was a continuation of the old lease with just under 90 years to run. Frank won’t be drawn on the details of the deterioration of his friendship with Silverstein, who is developing four of the five World Trade Centre buildings. The Port Authority has rebuilt the main tower, One World Trade Centre. Even when the planning was settled, the project continued to test Lowy and his team. The centre was expected to open in late 2015 but the Port Authority, which had responsibility for construction, was delayed by – among other issues – Hurricane Sandy and water leaks. Westfield did not lose money over the delay but had disappointed tenants to manage. “It has required patience, which we don’t have,” says Frank Lowy with a smile. The centre is unlike any other Westfield property and at first the layout is a bit daunting. The multi-level plans take time to comprehend, but Santiago Calatrava insists the project was designed so that even his grandmother could find her way around. His brief was to create “an inspiring, dynamic gathering place that will anchor the redevelopment of lower Manhattan”. The resulting Oculus – the name refers to the circular openings in Roman and Byzantine domes – does that with size and light. 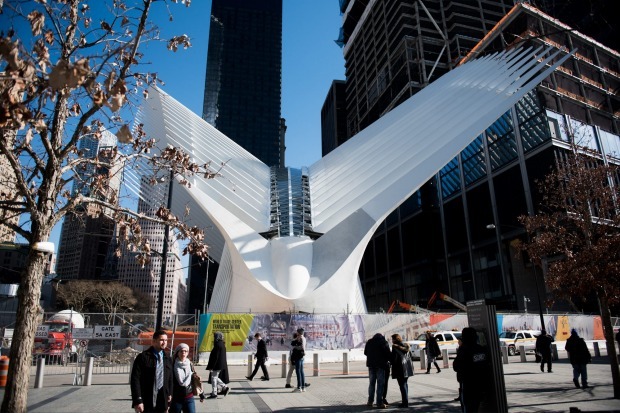 “I am always searching for more light and space”, Calatrava has said of his work. Diffused light illuminates the arched, elliptical space and, at the top, a skylight can open when the weather allows. Every September 11, at exactly the time of the first attack in 2001, the sun will beam directly through the opening, flooding the Oculus floor with light. Inside it is bound by structural steel ribs through which there are glimpses of the surrounding towers, including – looming large – the tallest building in the Americas, One World Trade Centre. The size of the space impresses, stretching over 100 metres end to end, like a giant white skating rink, and rising almost 30 metres to the skylight. From the outside, the Oculus is perhaps less successful. While the ribs continue rising, supposedly to look like hands releasing a dove, for some they look like the bleached bones of a long dead whale. And the scale of the building, which in isolation could have been a modern cathedral, is reduced by the sheer size of the office towers rising alongside. As the cost has blown out towards $US4 billion, it is not surprising that the Oculus has come in for criticism, given its primary purpose as a transit hub. “So did the Sydney Opera House,” Peter Lowy notes. Westfield’s shops are in the two levels of the Oculus and its white marble concourses, plus in the lower levels of two of the smaller World Trade Centre towers. Indeed it has already become a magnet for hard-bitten New Yorkers. New York Magazine interviewed some of the thousands who have visited since it part-opened in March, many of whom lie on the floor to fully appreciate the space. “All the other stations in New York are so old and dirty. This space gives me the Apple feeling,” said one architecture student. “It’s audacious … What worries me the most is that it is going to end up essentially a fancy shopping mall. I mean, $US4 billion for a fancy shopping mall?” said another. In essence, it’s not a shopping centre at all. At least not as we know it. “First and foremost, it’s a transportation hub, and the shopping is designed around it,” Frank Lowy says. Calatrava, who likens the Oculus to the Galleria Vittorio Emanuele II19th century shopping arcade in Milan, stressed the importance of the public space. “Our idea is to create a concerto, and create harmony among the shops,” he says. The executive director of the Port Authority, Patrick Foye, also believes a balance between shops and public space can be achieved, as it has been at Grand Central Terminal in Manhattan’s Midtown. Balance has meant compromise from Westfield, partly to fit around the basements of the new towers, which has crimped the size of the retail space to just 36,000 square metres, smaller than their 2001 allotment. The Lowys had wanted more than 80,000 square metres. But size doesn’t tell the whole story. While Sydney’s Westfield Bondi Junction is three-and-a-half times the area of the Westfield World Trade Centre, it is worth perhaps 20 per cent less due to Manhattan’s high rent rates and currency differences. In addition to retail, Westfield also has an event space of some 2000 square metres, which is like the playing field in the middle of a stadium, with the shops as the spectator stands. A further 600 square metres is located adjacent to the Oculus on the Church Street level. In time Westfield expects more than 100 million customer visits each year. Most importantly, Westfield Corporation shareholders have an asset worth far more than the $US1.42 billion purchase price: based on the locked-in income and at current investment returns, it’s probably worth close to $US2.5 billion. Westfield has put together more than 100 retailers in a global tenant roster, including Hugo Boss, Kate Spade, Penhaligon’s, Stuart Weitzman and Longines. Apple is taking two levels, and being a transit hub, there’s plenty of food outlets. Food market and New York institution Eataly will occupy an entire floor. Eataly chief executive Nicola Farinetti✓ says the World Trade Center is “an incredible place and we just couldn’t refuse it. Everything is going to be great and definitely going to be worth the wait”. Westfield forecasts that close to $US1 billion a year will be spent within the retail precinct when the centre is fully complete in a couple of years. This will come from the World Trade Centre workforce, the pockets of the growing resident population in lower Manhattan – now about 90,000 people compared with 25,000 a decade ago – plus from the 300,000 daily commuters passing through. Then there’s the September 11 Memorial & Museum visitors, who last year numbered 2.9 million. Importantly, success will not just be about leasing shops to retailers. That’s the old mall model and the Westfield World Trade Centre is the prototype of the new. In New York, the group hopes to earn up to 20 per cent of the centre’s income from a new suite of businesses, such as digital display, long-term corporate partnerships and events. Westfield will use its open areas for corporate events and launches, building on its successful Westfield London model. It will have a digital network of 19 screens – one four storeys tall and another 85 metres long – from which the Westfield Brand Ventures team will drive income, including from brand partners. As a hub of mobility, the Oculus is a perfect place to launch the concept, with further FordHubs planned for San Francisco and London, presumably in Westfield centres. Already the group has launched digital express parking, indoor mapping, advance food ordering and an online product search, as well as establishing a data and analytics unit to work with retailers to better understand and use the data generated from the millions of visitors. In Westfield World Trade Centre, customers will have digital access to premium-end services and amenities, and interactive directories. Westfield and the Lowys have changed since 9/11. Initially their mantra was “growth, growth, growth” and their US portfolio of malls rose to 61 in 2001. But with the financial crisis, the digital revolution and the shift in the nature of retail, their mission today is about wanting only iconic centres in the biggest markets, and they are selling off secondary malls. Fifty years ago Frank Lowy was at the forefront as shopping moved with the car to the suburbs. Now his business is moving with its customers back to mass transit and the urban core. Retailers are abandoning secondary stores but opening in the best, high traffic locations. Westfield’s focus is on “flagship centres” in the heart of great cities like London, New York and Los Angeles. “We have totally changed the nature of Westfield,” says Peter. “We will have 15 of the top 100, maybe top 50 malls in the world.” He is working on digital partnerships and other opportunities to leverage the flagship malls – concepts that neither he nor Frank could have imagined when they signed on to the World Trade Centre all those years ago. 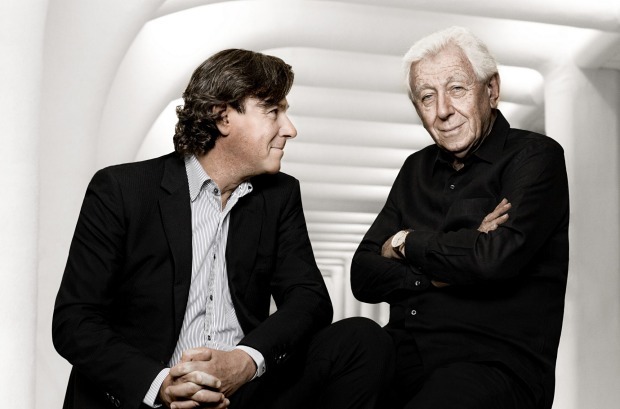 Frank Lowy turns 86 in October. Today, he roundly applauds America for rebuilding the 9/11 site into a powerhouse of commerce and business. 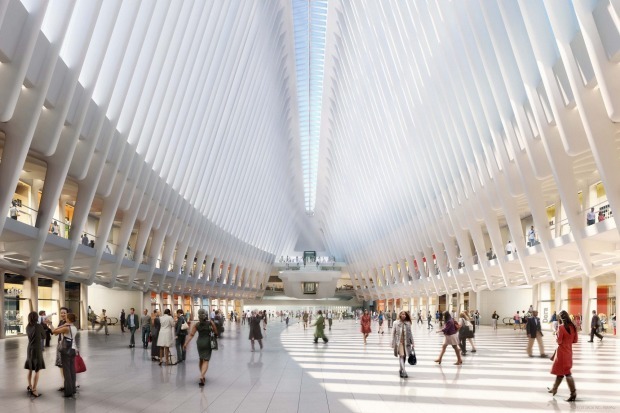 When he officially opens Westfield World Trade Centre in August, he says it will be with the private acknowledgement that the rebuilding was an opportunity for Westfield to have a small part in the symbolic and powerful response to the tragedy of September 11, 2001.